We’d love your help. Let us know what’s wrong with this preview of The Promise of Provision by Derek Prince. To ask other readers questions about The Promise of Provision, please sign up. “Perhaps the most remarkable example of this principle, that the provision of God does not depend on our circumstances, is God’s care for Israel in the wilderness. For forty years, God fed, clothed and guided something like three million people—men, women, old people, infants, plus their cattle, everything. This was in a totally barren desert where there was no water, no food—nothing, in fact, except sand and sun. God went out of His way to assert, “Let Me show you what I can do.” He made it dif “Perhaps the most remarkable example of this principle, that the provision of God does not depend on our circumstances, is God’s care for Israel in the wilderness. For forty years, God fed, clothed and guided something like three million people—men, women, old people, infants, plus their cattle, everything. This was in a totally barren desert where there was no water, no food—nothing, in fact, except sand and sun. God went out of His way to assert, “Let Me show you what I can do.” He made it difficult. He was the one who arranged the situation.” - Pg. 73, The Promise of Provision by Derek Prince; Bethany House Publishers. It’s billed as “the secret to receiving God’s supernatural abundance.” The book speaks about how to “break free from a poverty spirit,” and talks about the, “five principles for receiving God’s abundance,” “how you can bless others with His overflow,” and reads like an in-depth bible study guaranteed to challenge your notions of the word, “Abundance.” It’s most definitely not a book that teaches Prosperity Theology. That was my first thought when I chose this book to review. I was looking for something to encourage my husband and I through these difficult economic times. I had never heard of Derek Prince. Apparently, he passed away in 2003. His ministry is still alive. It was my hope that this book wouldn’t teach Prosperity Theology as I believe that is damaging and not biblical. Prince does not teach this theology. In fact, his idea of abundance does not match most people’s. Abundance does not mean wealth. Prince talks about Abundance as the fulfillment of God’s promises. He speaks about stepping into those promises, owning them, and the conditions of those promises. I have often overlooked the conditions of the promises. God is not simply going to give His abundance to a man intentionally sinning. There are consequences. Prince backs his words with scripture. Poverty, he says, is a curse. This book could really educate some Christian occupy people (Is there such a thing?) who view wealth as bad and poverty as holy. Prince rails against this viewpoint and does not hold to class warfare. Jesus, he says, took the curse of poverty on himself on the cross so that we, as His children, can have abundance. 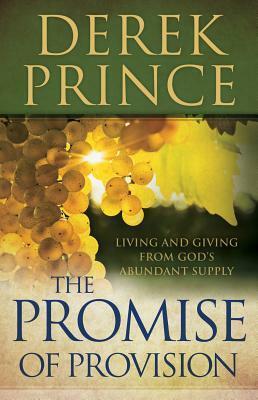 I loved how Prince spoke about the promises of provision in the earlier chapters. I had never thought about how God had provided ahead of time everything His people needed from Genesis to the New Testament. Food and shelter were provided at the place He told them to go, and that includes the Apostles when Jesus sent them without provision to unknown towns and lands. Everywhere they went they had abundance. God knew ahead of time where His people were going and as long as they followed His direction, they had provision. The conditions of God’s promises were enlightening. How could I ever worry again about the bills or where we are going when all we have to worry about is loving Jesus so completely that we honor Him with our choices, following His edicts as He directs in the Bible. Abundance does not mean wealth. This book is amazing in how it talks about tithing and offering. It talks about fiscal responsibility, not entitlement. Entitlement is not biblical. I would recommend this book to anyone struggling economically. If you are having trouble tithing, let me know in the comment section of this post before January 31 for a chance to win a copy of this book. It will change your mind about money, reveal God’s promises, and stun you in the revelations that were there in the Bible this whole time. Coming from a childhood of poverty, I have struggled for many years with the concepts of wealth and poverty as well as blessings and curses. The Promise of Provision: Living and Giving From God's Abundant Supply is the first book I have ever read on God's provision that is truly Biblical as well as easy to understand. Although I have learned some of these principles in my own life over many years, I find my own experiences to be confirmation of Derek Prince's provision philosophy as expounded in Coming from a childhood of poverty, I have struggled for many years with the concepts of wealth and poverty as well as blessings and curses. The Promise of Provision: Living and Giving From God's Abundant Supply is the first book I have ever read on God's provision that is truly Biblical as well as easy to understand. Although I have learned some of these principles in my own life over many years, I find my own experiences to be confirmation of Derek Prince's provision philosophy as expounded in this book. 1. All of God's promises hold the provision. 2. All of God's promises are our inheritance. 3. All of God's promises are an expression of His will. 4. All of God's promises are now available to us through Christ. 5. All of God's promises being fulfilled do not depend on our circumstances, but rather upon our meeting God's conditions. Gives 5 principles for receiving God's abundance with steps and guidelines to get you there. He was born in India of British parents. Educated as a scholar of Greek and Latin at Eton College and Cambridge University, England, he held a Fellowship in Ancient and Modern Philosophy at King’s College. He also studied Hebrew and Aramaic, at Cambridge U Derek Prince (1915-2003), was an International Bible teacher and founder of Derek Prince Ministries International, wrote more than fifty books.